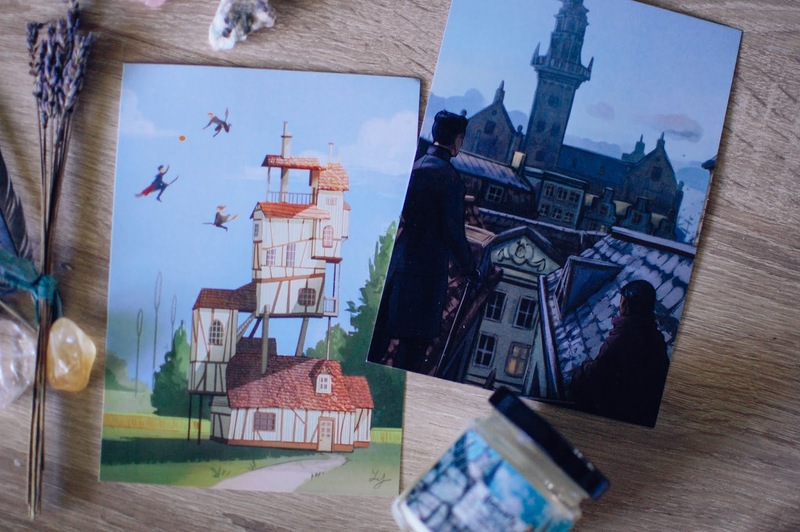 Wick & Fable is a company I have had some experiences with before. They craft literature based candles and also curate monthly subscription boxes. A friend told me about a Studio Ghibli box they released about a year ago. I picked it up and enjoyed it. Their 2 ounce candles were perfect for my nightstand and they threw well. I didn't blog about it but I very much liked it. 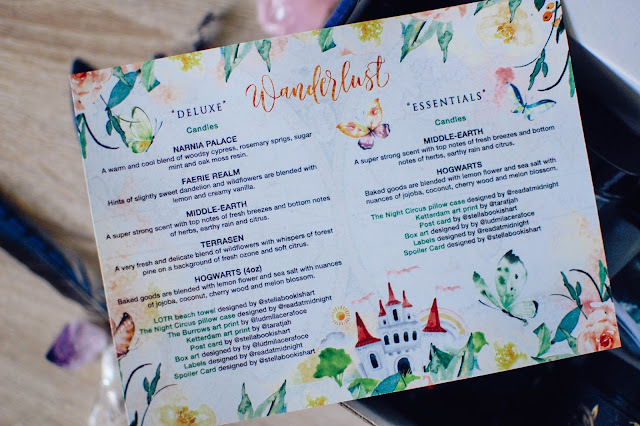 I bought some BOGO 1/2 off candles a few weeks ago and also spied a fun Wanderlust box that featured fantasy themes. They have Essentials boxes for $24.99 and Deluxe boxes for $49.99. Often a 10% off coupon can be found online from various brand reps. I have used Melody10 and a few others. I used a 10% off code for this Deluxe box and after the $5 shipping it was pretty much $50 even. It came shipped in a huge priority box and I almost didn't recognize what it was. That is because one of the items in the box was a huge circular towel with a fringe on it. It was a Lord of the Rings towel so I was totally stoked. Sorry I didn't take a photo. But it was cool. What is also cool is the artwork. 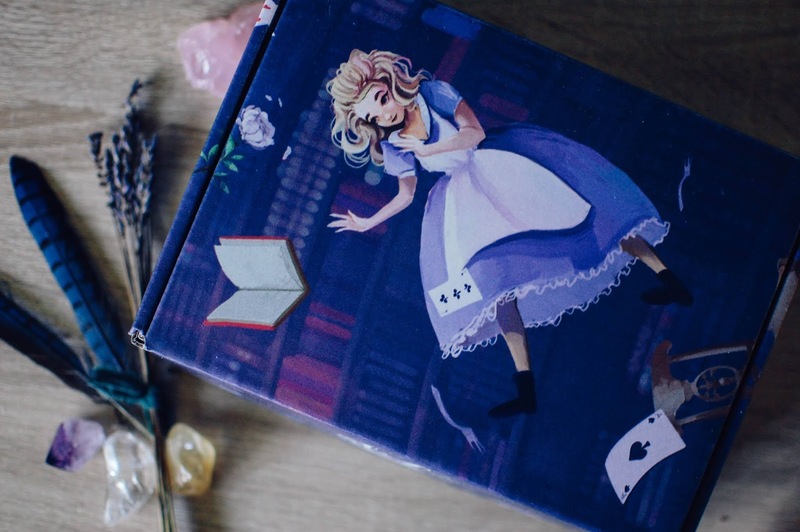 The box itself ended up being an Alice in Wonderland theme while the information card was more whimsical fairytale. Two art cards came in the box. One is from Harry Potter and the other is from Six of Crows but I am still pretending it is Harry Potter. It kind of reminds me of when they were on the roof of Borgin and Burkes spying on Draco. I am always up for some Burrow reminiscing so naturally that one is my favorite. Some of my treasured scenes in the book are of Molly singing to the warbling Celestina Warbeck while darning socks or slicing root vegetables for dinner by magic. 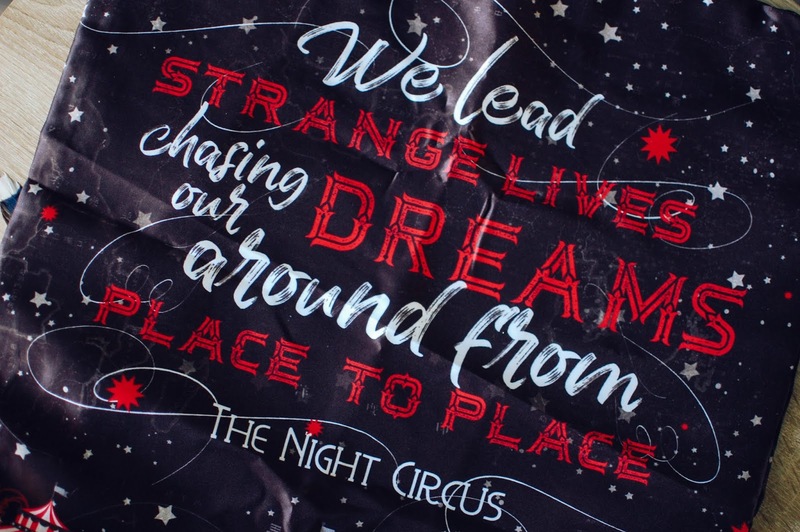 My friend Sandra has extolled the virtues of The Night Circus and I am ready to hunt it down. After all, there is a pillowcase in my possession now with that theme. It is quite large, no wimpy pillow cases here. I would say it fits a standard 20" or so square pillow. If I ever get a designated library room I would totally use this pillow in there. Candles! Wick & Fable makes pretty candles. I just love the labels and they often do well for me. The notes are an interesting blend. Fresh bakery? But the overall scent pleasantly comes off as a picnic on a spring day with a plate of lemon squares to enjoy. Having burned these candles before, I am familiar with their quality and it is nice to say they are pleasantly consistent. They burn very well, with strong wicks and an easy wax pool. The wax pool though... it is something to behold. As the wax melts a fine galaxy of glitter starts to fountain up from the center and moves out to the edges. In the smaller 2 ounce candles it does it quite rapidly and in this 4 ounce one it moves more slowly. Once I burned this candle the lemon bakery reminded me of the treacle tarts I made several years ago. A mellow sweet bakery with the barest hint of lemon zest for subtle flavor. The soft florals paired surprisingly well with this. The throw was medium-strong by the bath tub. Incidentally, it made for an excellent bubble bath scent. Lightly refreshing and subtly sweet. This is one of my favorite scents in the box. 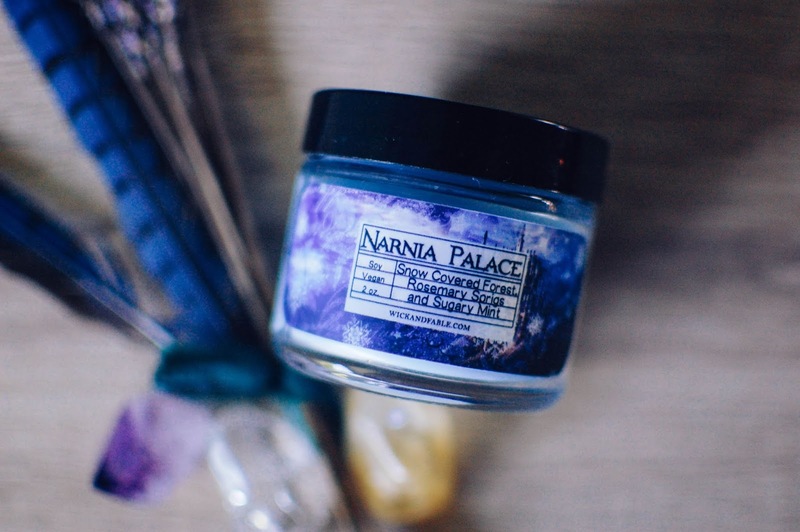 I enjoyed reading the Chronicles of Narnia and having this wintery sweet scent that matches it is wonderful. The mint is very mellow but the sugared herbs and woods are lovely. I am saving this one for nightstand burning this winter. Maybe my birthday? A sweet clean aroma with vague lemon tones. It reminds me a little of that yuzu bubble bar from Lush that I like. Definitely a little Lushy. Creamy clean citrus. I like it. The citrus in this one is very zesty and not as creamy and mellow as Middle Earth. This reminds me of the Celestial Seasonings Lemon Zinger tea that has nuances of hibiscus and raspberry along with the strong lemon. This one burned beautifully and threw medium-strong in the office. 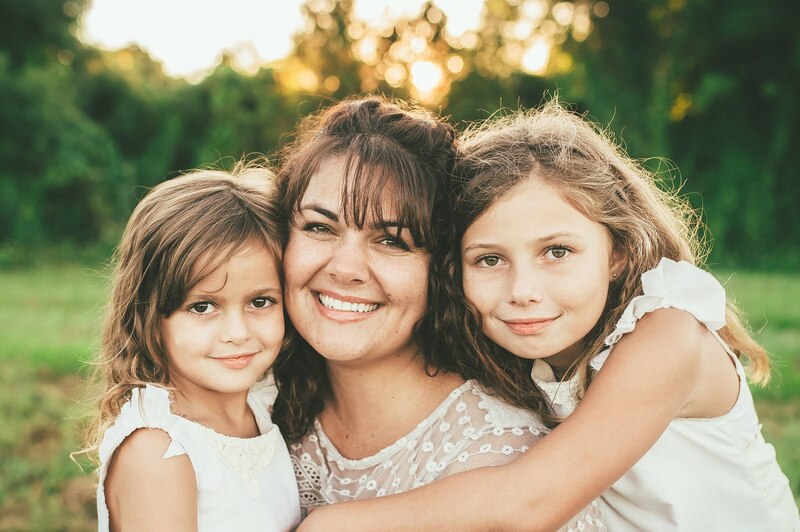 I had this going for the one hour live chat Montessori class I was attending and within that time it had formed a nice wax pool and aroma in the room. The lemon was a touch too herbal and sharp for my liking but I will still burn it up. Check out the video below to see that glitter bubbling up in the wax. 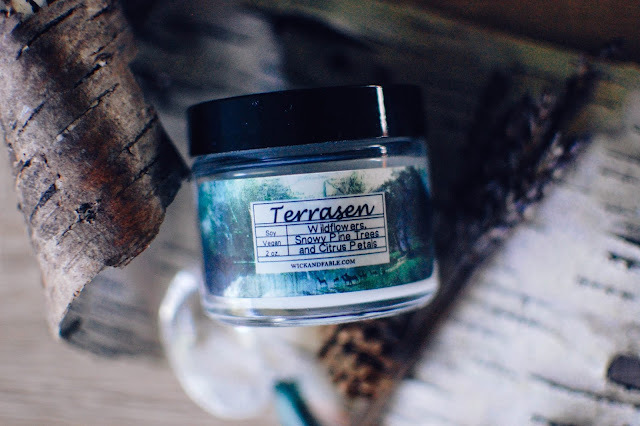 This one possesses watery notes that feel more like aloe and mellow cactus and sea salt. I burned this one on my nightstand. I love these two ounce sizes. They fit perfectly in these Turkish candle holders my friend Ashley gifted me from when she lived there. This one burned evenly and beautifully. It threw medium-strong in my bedroom. The scent retained it cold throw impression and was relaxing. I liked the theme, though the Wanderland seemed a bit all over the place. Happily there were a few of my fandoms and the towel and candles were worth it alone. The candles seemed to be lemon focused which was suitable for summer offerings. 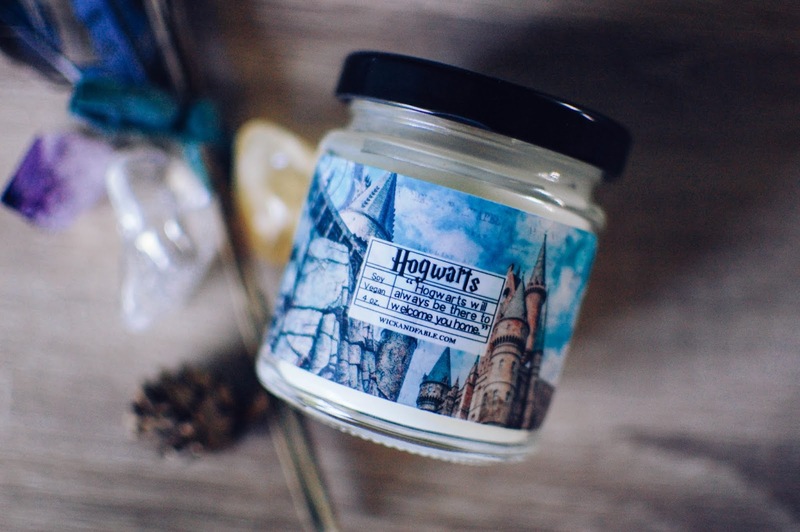 They currently have a Hogwarts box up on the website (yep I bought it) and it looks to be pretty darn sweet. 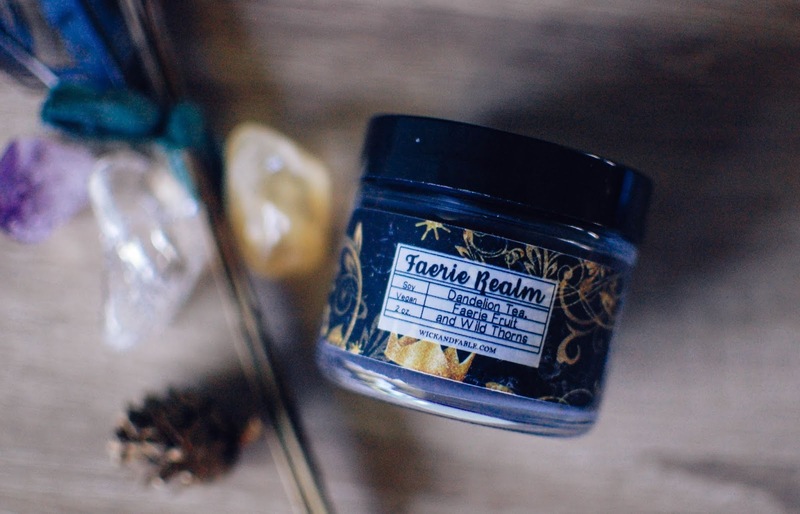 Keep your peepers peeled for some random Wick & Fable candle reviews. I have several to feature as fall rolls in. Have you tried Wick & Fable? Are you currently trying out any subscription boxes? I'm not familiar with this vendor either. I like that they seem to have put thought into the scents they put with fandom names. You know, unlike others we've seen where they just smack a popular name on a popular scent and really they have nothing to do with each other. I definitely benefitted form your last sub box experience. My favorite things are the kitty plates that hand near my desk at school. The Melting Fairy was pretty cool. Did you see that Rosegirls has a sub box? I agree. They really are well thought out scents as far as theme. 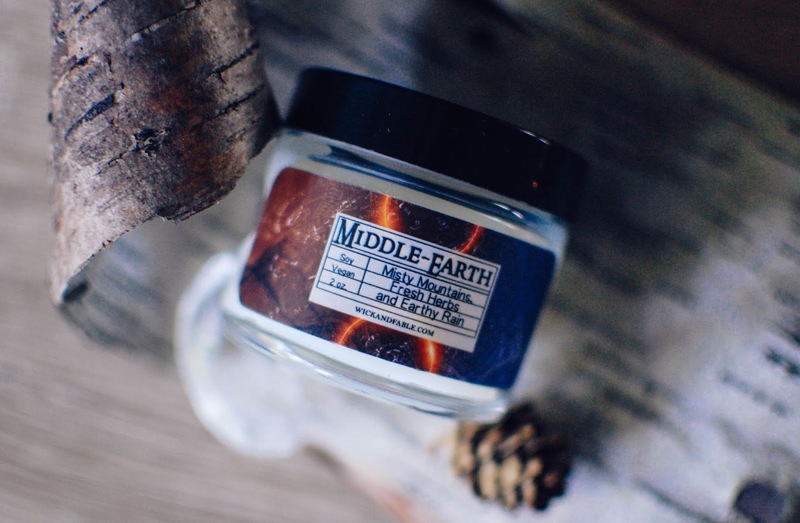 I was looking at some other themed scents recently from another vendor and none of them really seemed to fit the pop culture reference they were named after. It made me chuckle and think of you. And it kinda made me bummed because I liked the movie they were made after. I did not know RG had a sub box!? Where can I find more about that?? Jenny runs it as a separate entity called... wait for it... Smell My Box. Oh man. Sounds a bit suggestive. But hey it is fun. She has a 3 month and 6 month sub choice but both are currently sold out. Not sure when she will renew or open it back up again. Oh yeah, I think I did see that somewhere. It think it might have been too pricey for my cheap ways or something. Hmm, if you hear about it again let me know. Wow, beautiful stuff! You should definitely read The Night Circus if you haven't yet. I haven't and now it is all I can think about. I need to hunt it down. It seems like it is right up my alley. OOoh glitter, quite pretty and hypnotizing. Literary candles and scent inspo are my love language, this is an exciting haul. 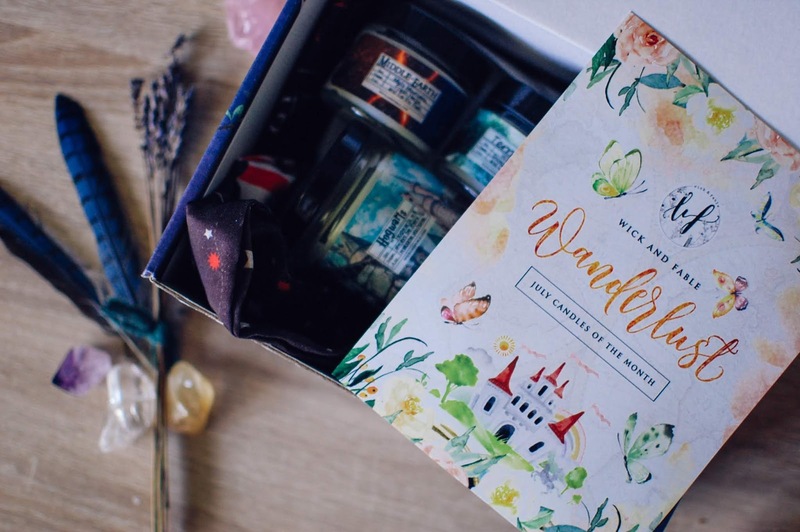 The original Alice art is spectacular and at least a box of mostly candles means you will use the items or gift them, Narnia Palace sounds lovely. No LOTR towel photo huh? Can you give a hint as to what the art was? I might get the reference, I actually just starting reading the Fellowship today @_@. Oh Sandra is going to go nuts over that pillow case, my sis recommended Night Circus awhile back, I need to get to it too, happy reading. I thought of you when I was enjoying the candles and descriptions and artwork. I am always happy to use boxes like this for sending friend gifts. Wick & Fable makes some nice boxes (Riddles Quarterly does too!). I was feeling lazy and didn't want to take a pic of the towel but I can for you if you want. It is huge. And nice. It is circular with tassels on the fringe and I think is says the cliche "Not all who wander are lost" but not sure. I will take a photo :-) It is super nice though! Congrats on starting the book! I am excited for you!! I am really hankering to make that LotR/Hobbit quilt. I think I just need to print out one pattern at a time and start. I need to sneak that pillowcase in the next box I send her. WHOOHOO! Gonna do it! Just gotta find it! !